Trip Announcement - Headed to Ethiopia! Trip Announcement – Headed to Ethiopia! For a few months now, I’ve been quietly working with a serious trip mastermind for a trip at the end of the month and it’s finally time to make the announcement of what we’ve been working on. Well the title sure gives it away but YES, I’m headed to Ethiopia! I’ll be honest, when I pictured a trip to Africa in my head, Ethiopia wasn’t somewhere I had imagined that I would go to first. Most think about the safari’s of Tanzania and Kenya, climbing Kilimanjaro or relaxing in in South Africa. So how did it all go down? Well, remember that little thing I did last year called Competitours? Well, the one I like to call the evil genius of the trip, Steve, reached out to me in December about the possibility about joining him on the most daring trip he’s ever done. Curious of course, I asked more and it turned out he was talking about Ethiopia. It definitely caught me by surprise but Steve didn’t have to do a whole lot of selling. He said he was thinking about a few spots and that I should “Google it”. I took a look at the few areas he mentioned and I was blown away. I took some time to think about it and it wasn’t an easy decision because a lot of unknowns but ultimately I said yes to the trip! This will most certainly be the most daring trip I’ve done to date and will push me beyond my comfort zone. For one, I’m relinquishing full trip planning control to Steve. Am I worried though? Not really because if Steve could manage the logistics and challenges flawlessly for 20 strangers in Europe, I have confidence in him figuring this out for just the two of us. Still, it is definitely unnerving for my OCD self to not know the exact routes we’ll be taking. Another thing is just the unknown factor of Ethiopia. I really don’t know a whole lot about Ethiopia. Even when I did a search for other travel blogs on the subject, I didn’t find much out there. So when someone says “off the beaten path” this is surely it. As ignorant as this may or may not sound, you also can’t do a trip to Africa without at least thinking about safety. You know what it was a concern for me but as I talked to more people and read about others’ experiences in the past few years, I realized that the country’s developed quite a lot in the past 10 years and the specific regions we were going to were going to be safe. Despite all of the unknowns, touted as one of the world’s top tourism spots in 2015 by the European Council on Tourism and Trade, I’m excited beyond belief. This may be the one and only time I’ll be able to do a trip like this so I’m fully taking advantage while I can. In the developing world that we live in there are only a few places remaining that are untouched by globalization. The Lower Omo Valley is one of those places. As a crossroads of literally thousands of cultures and ethnic groups in the region, the valley is home to “vanishing” tribes. 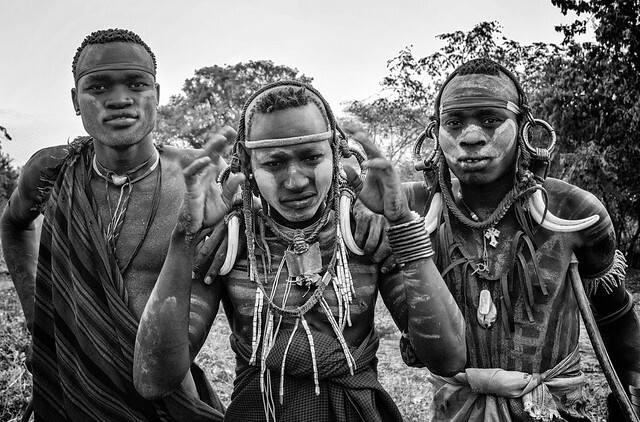 From Mursi, Hamar, Bodi, Nyagatom, Daasenech, Banna, Dies, Dorze, Konso, Karo, and Ari, we’ll be visiting them all. For this leg of the trip, we’re going to be using two local operators by the names of Solomon Mulugeta and Melak Tadesse. Both typically work solo but Steve has actually gotten the two to work together as a team of sorts to take us on our expedition. I’ve been probing them for more information these past couple of weeks and from the sounds of it, we’ll be largely playing it by ear depending on what festivities are happening in a certain tribe and what they hear on the ground. I’m preparing myself to be uncomfortable and surprised. This is the kind of trip that’s not just about doing adrenaline-based activities but is a trip for a real “traveller” where life is truly enriched through genuine and unique experiences such as this. What excites me is the incredible photography that I’ll be able to do on this trip. Originally I was thinking of keeping my long lens (Olympus 40-150mm) at home but right now I’m thinking it will be worth it. While the English may be a bit broken, you get an idea of what we’ll be embarking on from the words of Solomon. Some of the Things to do in Omo valley tour are not found in fixed place and not in fixed time or date. Obviously the tour starts in Arbaminch and ends in Arbaminch. In all other day’s we will be following The tails of events and festivals ahead of us. The itinerary is not one after another like A, B, C, D. Today if we stand on A and tomorrow could be the right time to visit D, then we will skip B and C and visit D. And after we we turn to visit the places we skipped. I can’t brake down the itinerary daily, but I can tell you what things we will do and places we will visit in any ways the tour rolls. I’m going to say it. I’m a little crazy for doing another mountain trek considering I just did the Inca Trail last year. Especially with how “well” I handled the altitude, I was a bit hesitant on this but in seeing the photos from the region and the chance to see baboons and ibex, I felt that this would be worth it. Plus it was on Steve’s must-see list so I was much obliged to be a team player as well. Landscape wise, centuries of massive erosion on the Ethiopia plateau have carved out some incredible vistas of precipitous cliffs and deep, canyon-style gorges. The trek starts in Debark and summits to Ras Dashen at 4,543 meters which is slightly higher than Dead Woman’s Pass (4,215 meters) of the Inca Trail. With that said, I’m actually less worried about this trek since the trekking path will be more of a rolling path as opposed to the harsh staircases in Peru. I think one of the big shockers for me is the fact that as part of our group, we’ll need a scout (with AK-47) as mandated by the national park. It sounds scary but is a precaution set by the government to ensure safety. So from that perspective, I guess better to have a guy with an AK by your side than not right? Our main guide for this trek will be Dawoud Sulay of Ethio Simien Mountains. He’s highly spoken about on the forums and I would say the more organized of the two operators we’ll be working with. For one, he has a full website and was able to provide an itinerary in a Word document. I’m also very excited to be staying at the Limalimo Lodge which just opened this year. It’s perched on the edge of the escarpment and has the formidable view ofs of the national park. I love how there’s a huge focus on sustainable tourism, minimizing impact on the environment, and giving back to the local community. My Ethiopia packing guide is out so if you’re curious to know what I brought and what you should bring to Ethiopia, check it out! This is such an adventurous trip. May I say that only a few people are courageous enough to go to these so-called trivial areas in Africa, but that should not be the case. Ethiopia and Tuvalu are definitely in my to-go list. So excited to know about your experience! Hey Sagar, yeah what you’re seeing are the clay lip plates of the Mursi tribe. Women have their lips cut at an early age and stretched to fit the plate. It’s ceremonial and the larger the lip plate, the more beautiful a woman is. Quite a remarkable custom that still continues on today. I think you should back out if there’s still time. That Steve dude sounds like a catastrophe-in-waiting. Nice try Steve. You can’t get rid of me now!!! Sounds like an amazing adventure … Ethiopia is one of my must see places in Africa! Sounds like you are in for an awesome trip. Many people usually conjure up scarely visuals when they think about destinations in Africa, which is just a shame. There are many beautiful places on the continent that people miss out on because of, in most cases irrational fear. I am sure you will have an amazing time. Cant wait to see pictures on the blog.